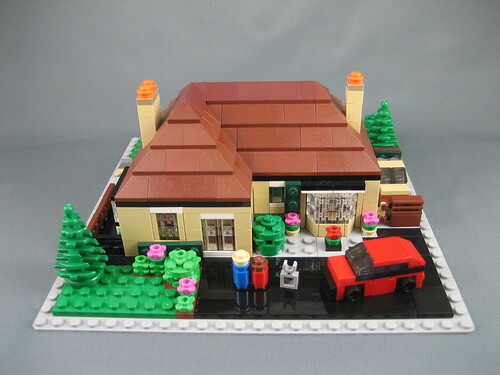 Brick Town Talk: Microscale Monday 02-18-2013 - LEGO Town, Architecture, Building Tips, Inspiration Ideas, and more! Tinytown - (BTT) After a some recent (and stunning) examples of modern single-family residences, it's nice to return to a more traditional little slice of suburbia. This one-story charmer might be small in footprint, but is large on details - especially nice are the gardens and bay window overlooking the driveway. For this happy couple and their dog, it might not make the cover of the next issue of Mansions Monthly, but it is home.